Let’s be honest — most of us aren’t planning to stick to a strict diet on Thanksgiving. 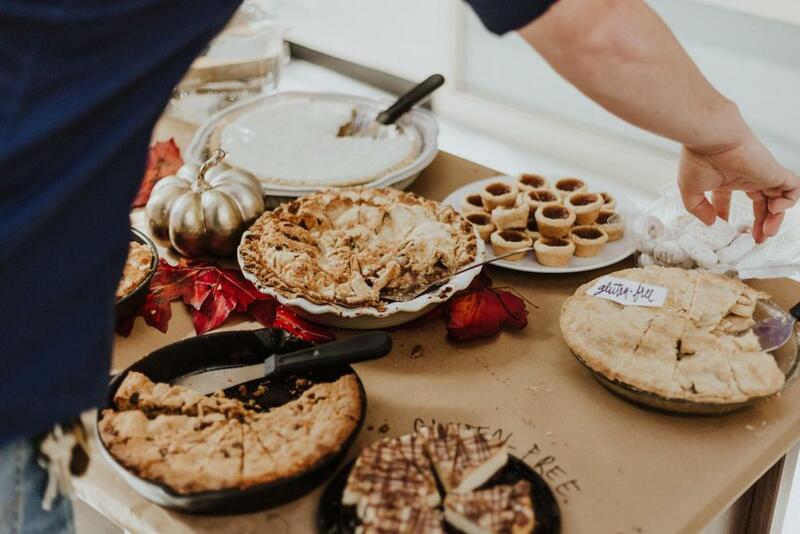 We set aside this time of the year to indulge in foods that we’d typically avoid, and it’s totally normal (and even healthy) to dig in more than usual during your big Thanksgiving dinner. But some of us take things a little too far. 1. Fill half of your plate with non-starchy veggies. According to MyPlate, to build a healthier meal, half of your plate should be filled with fruits and veggies. Translate this to your Thanksgiving meal by filling 50 percent of your plate with non-starchy options like carrots, green beans, Brussel sprouts, collard greens, bell peppers, green salad and the like. Non-starchy vegetables tend to be lower in calories than their starchy cousins like corn, potatoes and winter squash. Try to fill your plate with a smaller portion of this latter group to avoid going overboard with your calorie intake. 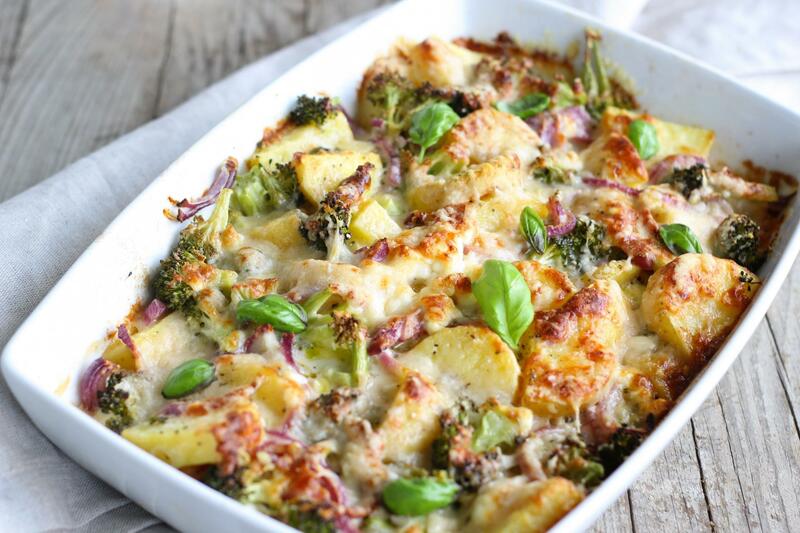 Also, try not to group any veggies that are baked into a casserole into the “vegetable” category. Since most casseroles are made with breadcrumbs, rice, grits or barley (or a combination thereof) this dish should actually be considered grain-based and not veggie-based. 2. 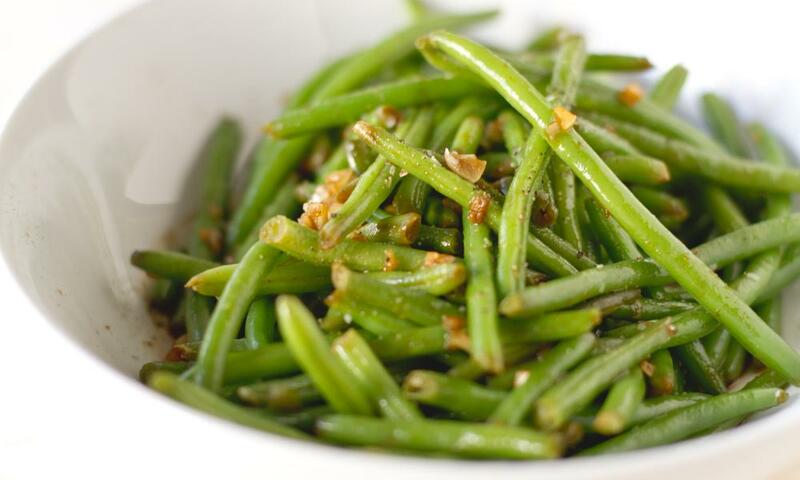 Restrict those starchy dishes to one-fourth of your plate. It’s hard to resist all of those delicious, carb-heavy side dishes that Thanksgiving is so famous for, and we won’t tell you to avoid them completely. But if you’re piling scoop after scoop of mac ‘n’ cheese onto your plate, you’re in for a real food coma that’ll last you the rest of the day. 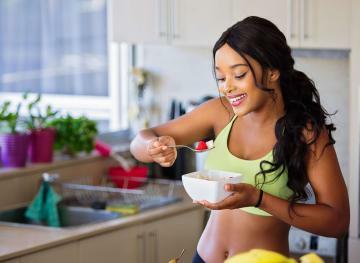 Since MyPlate recommends that a little over one-fourth of your plate should be reserved for grains — preferably whole — keep starchy side dishes and grains from filling more than roughly 30 percent of your plate. To make this easier, reserve that part of your plate for the starchy side dishes that you’ve been craving for months like stuffing instead of wasting the space on boring carbs like plain ol’ dinner rolls. And if you’re going to use a dinner roll to scoop up that leftover sauce on your plate, stick to the whole wheat kind. 3. Load up on turkey, but consider eating it without the skin. MyPlate recommends that you fill less than one-fourth of your plate with protein, an amount that’s roughly equivalent to three ounces or the size of a standard deck of cards. But since it’s Thanksgiving and turkey itself is relatively low in calories, eating a little more than the recommended serving size for protein isn’t going to derail your diet. 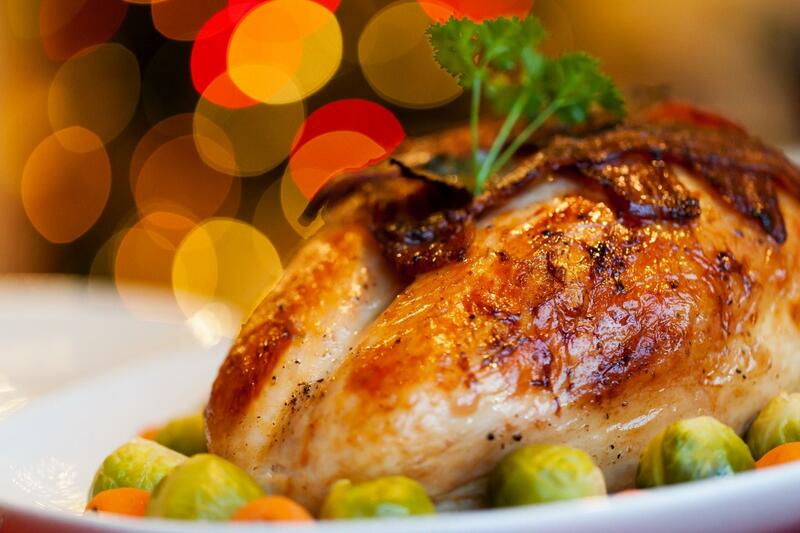 If you’re trying to cut back on your fat and calorie intake, consider eating your turkey without the skin. A 4-ounce serving of skinless turkey leg has 183 calories and 1.6 grams of saturated fat. The same serving size for a turkey leg with the skin has 206 calories and 2.4 grams of saturated fat. That 23-calorie difference might not sound like a lot, but it adds up if you’re piling on the turkey. White turkey meat, like turkey breast, is also lower in calories and fat compared to the dark meat found in turkey legs. So opting to eat a turkey breast instead of a turkey leg could further reduce your calorie and fat intake. However, keep in mind that dark meat contains more essential nutrients like iron, zinc, riboflavin, thiamine and vitamins B6 and B12. So if your main concern isn’t just to find the most low-calorie turkey option, eating dark turkey meat can be a healthy choice as well. 4. Take a breather before dessert. 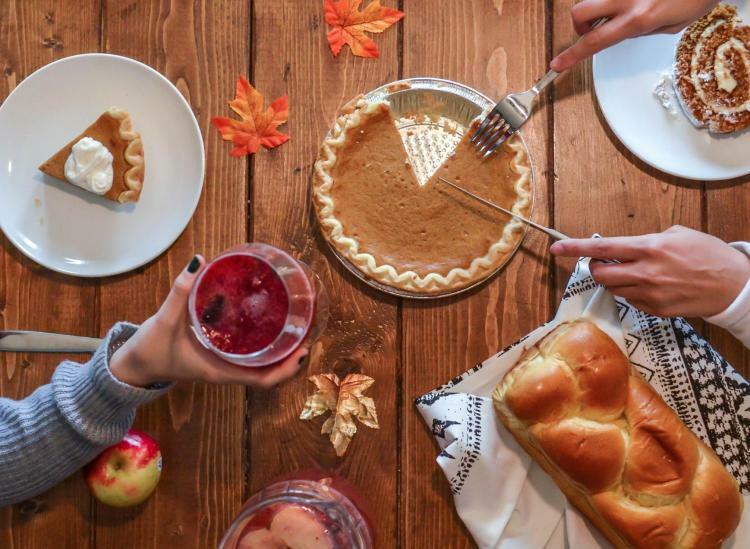 After you’ve finished filling up on turkey and stuffing, it might be tempting to dig right into that slice of pumpkin pie, but consider first giving your stomach a breather. You feel full as a result of your brain reacting to hormones released by your body when you put food and drink into your stomach. But it takes around 20 minutes for your brain to fully register those hormones, which leads to that well-known feeling of fullness. If you don’t put down the fork and give your brain a chance to evaluate the extent to which your stomach is full, you can risk overeating and feeling uncomfortably stuffed as a result. 5. Remember: Alcohol adds calories, too. 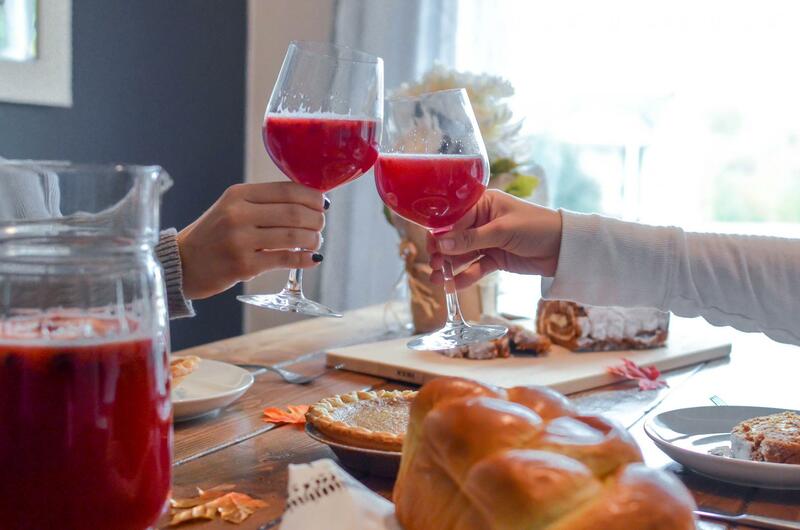 Most of us are aware of the calories that we’re ingesting when we’re eating a piece of pumpkin pie, but the same thought doesn’t usually cross our minds as we guzzle down a big glass of wine. But 1 gram of alcohol actually contains 7 calories, which is more than the 4 calories provided by 1 gram of protein or 1 gram of carbohydrates. What’s more, alcohol’s calories are considered “empty calories” because they don’t provide your body with any essential nutrients and, therefore, have no nutritional value. To keep your intake of calories from alcohol in check, familiarize yourself with the recommended serving size for each type of alcohol. In the United States, one “standard” drink contains roughly 14 grams of pure alcohol. This is equivalent to approximately 5 ounces of wine, 12 ounces of regular beer and 1.5 ounces of 80-proof distilled spirits (like gin, vodka and whiskey).